One person's woodworking journey, with a focus on handtools, a nod to the past, and an appreciation for the creative spirit. Four months later, and I'm almost finished with this workbench. I added a sliding deadman even though the span between the legs is only 27". The top of the deadman has a 3/8" x 3/8" tongue that fits into a matching groove on the underside of the bench. The bottom skate of the deadman has a V-groove that slides along a V-shaped track that's glued to the front stretcher. I shaped the wedges for the tusk tenons to match the wedge in one of my antique moulding planes. I still need to figure out what shape to make the ends of the long stretchers. I may add holes to the front right leg, but will wait to see if I need them. I ran holes along the front edge of the benchtop in between the legs and added only one more opposite the front left leg. I use that for a planing stop. I'm finding all sorts of benefits to having a removable split top. For one, I can remove the back half of the benchtop if I need to clamp a board on both sides of the bench. It's similar to a thinner, Japanese-style bench. Also, I only need to lift it about 5/8" in order to remove the sliding deadman. I still need to add a removable shelf, sand the base and apply finish, in addition to shaping the ends of the long stretchers, but that's nothing compared to the work that's behind me. 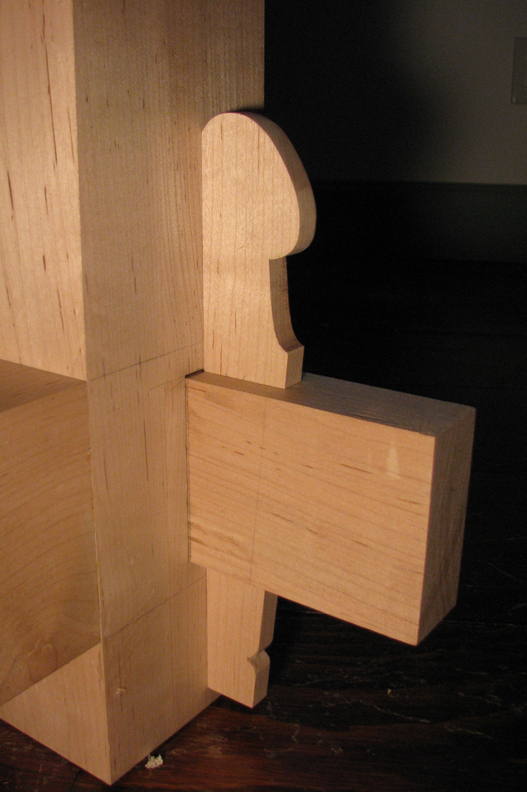 Oh, and the parallel guide works now without having to enlarge the mortise. I slathered it with wax and no longer jams. 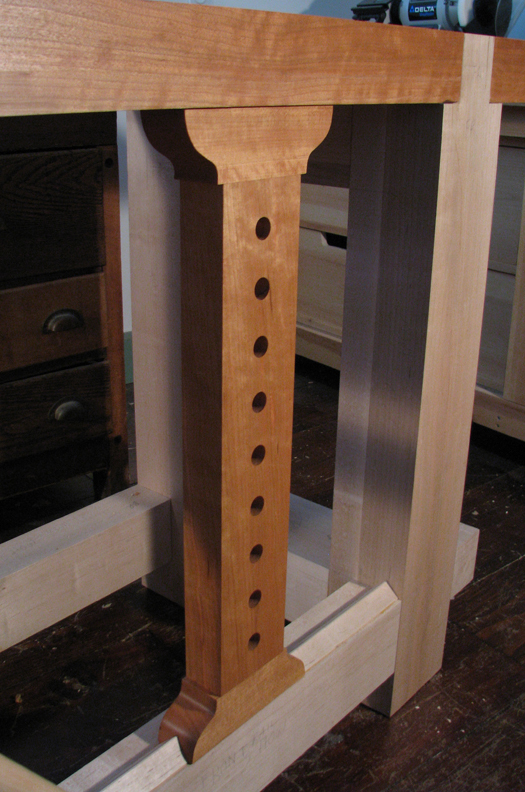 Planing stop uses only one hole. I like woodworking. Nothing else. Just woodworking, woodworking, woodworking. And ice cream. All material on the Village Carpenter blog is original and copyright-protected and can only be used with the express permission from the author, Kari Hultman. The Village Carpenter Blog by Kari A. Hultman is licensed under a Creative Commons Attribution-NonCommercial-NoDerivs 3.0 Unported License. Based on a work at villagecarpenter.blogspot.com. Permissions beyond the scope of this license may be available at http://villagecarpenter.blogspot.com.